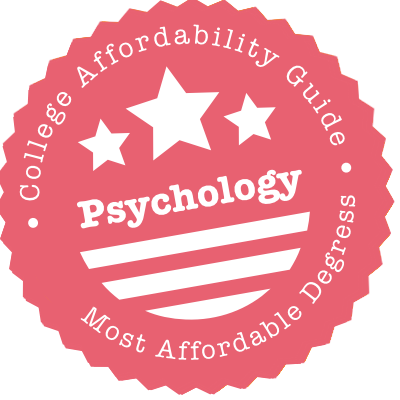 Scroll down to see the most affordable psychology degrees, as well as info on the different types of psychology degrees and psychology program accreditation. UC Irvine's School of Social Ecology offers a Bachelor of Arts in Psychology and Social Behavior degree with specializations in infant psychology, health psychology, pre-clinical/psychopathology, and social, personality and environmental psychology. The school offers a self-paced post-baccalaureate program that consists of eight courses and designed for individuals who are seeking to strengthen their graduate school applications. There is also a Doctor of Philosophy (PhD) in Psychology and Social Behavior degree with the following areas of specialization: development psychology, health psychology, social/personality psychology, and affective science. PhD students can also opt to concentrate in psychology & law (forensic psychology). As part of the School of Social Ecology, undergraduate psychology majors can apply for the Fudge Family Scholarship (up to $5,000). The Department of Psychology at the University of Minnesota-Duluth offers a Bachelor of Applied Science in Psychology and a Master of Arts in Psychological Science. An online bachelor's degree completion program in psychology is also available. The B.A.S. in Psychology requires 52 credits of major coursework, including courses in biology, statistical methods, developmental psychology, abnormal psychology, learning and behavior, cognition and social psychology. The online degree completion program in psychology is designed for students who already hold an A.A. degree and only accepts 15 new students per year. The M.A. in Psychological Science is available in three areas of concentration: clinical-counseling psychology, experimental psychology and industrial-organizational psychology. The Department of Psychology at Texas A&M University offers a Bachelor of Arts in Psychology, a Bachelor of Science in Psychology, a Master of Science in Psychology, and a Ph.D. in Psychology available in six concentrations: Social & Personality Psychology, Clinical Psychology, Behavioral and Cellular Neuroscience, Cognition & Cognitive Neuroscience, Developmental Psychology, and Industrial/Organizational Psychology. The Texas A&M Psychology Department was ranked 22nd for publications by American Psychological Association journals in between 1986 and 2008, and faculty members have been the recipients of numerous awards for both teaching and research. Common research themes of the psychology program include personality and individual differences, diversity science, neuroscience, and affective science. Rutgers University offers a wide range of psychology degrees, from bachelor's degrees to specialized Ph.D. programs. All three campuses have a bachelor's program in psychology, and USA Today listed Rutgers-New Brunswick as one of the Top 10 undergraduate programs in psychology. Educators can earn a Master of Education in School Counseling and Counseling Psychology from the College of Education. The Graduate School of Applied and Professional Psychology offers a Doctor of Psychology in Clinical Psychology or School Psychology. The School of Graduate Studies has doctoral programs in clinical, cognitive, and social psychology as well as behavioral and systems neuroscience, all research specialties of the Rutgers psychology faculty. The Psychology Department pays students to participate as research subjects. The Department of Psychology and Neuroscience at UNC offers bachelor and Ph.D. programs in Psychology. Undergrads can choose to pursue either a Bachelor of Arts or Bachelor of Science in Psychology. The B.S. requires students to take more physical and life science courses than the B.A. program requires. UNC students can also minor in psychology or in neuroscience. Psychology majors can apply for the Karen M. Gil Internship Program in Psychology, which places students in a worksite in the Chapel Hill area and offers a stipend and academic credit. The Ph.D. program allows students to specialize in one of six sub-fields: behavioral neuroscience, clinical psychology, developmental psychology, social psychology, cognitive psychology, or quantitative psychology. UCLA's Psychology Department offers three undergraduate majors: BA in Psychology, BS in Cognitive Science, and BS in Psychobiology. The programs give students the opportunity to study a wide range of behavioral patterns as well as the research methodologies and theoretical approaches employed in the discipline. Students can take a variety of specialized courses in addition to the core coursework, including classes in learning and memory, animal behavior, cognition, and perception. The department offers a Doctor of Philosophy program with emphases in behavioral neuroscience, clinical, cognitive, developmental, health psychology, learning and behavior, quantitative, and social psychology. There is no terminal Master of Arts or Doctor of Psychology degree. Incoming psychology students with financial need can apply for the Joseph Helfgot Memorial Scholarship ($2,500). UIC offers a Bachelor of Arts in Psychology with general and applied tracks. Candidates for a PhD in Psychology receive funding for at least the first year at UIC; in return for serving as teaching or research assistants, they earn a tuition and fee waiver plus a stipend worth upwards of $14,000. The department aims to continue this funding through four years, depending on resources. Those with a clinical focus benefit from a top-50 program, according to U.S. News & World Report's 2018 rankings. At Baruch College, undergrads may earn a Bachelor of Arts in Psychology or a Bachelor of Business Administration in Industrial/Organizational Psychology. Graduate students can earn a Master of Science in Industrial/Organizational Psychology. Students pursing the B.A. must complete 25 credits in psychology, including two required classes. Because so many of the credits are in electives, students can devise a plan of study that matches their career goals. The B.B.A. also requires 25 credits. The master's program is open to full-time and part-time students and requires 36 credits. Candidates may opt to join a research group and work on research for two semesters under the supervision of a faculty adviser in place of writing a master's thesis. Budding psychologists have two routes to choose from at Vassar: a bachelor's in Psychology or the Neuroscience and Behavior Program, an interdisciplinary major offered in conjunction with the Biology Department. Either way, they'll have their eye on the Undergraduate Research Summer Institute, which accepts 60 science students each year to conduct paid research on campus. The funds don't stop after senior year. Psych majors can request money from the Margaret Floy Washburn Fund to pursue graduate studies in the discipline. Throughout, students get to conduct research at the on-campus Wimpfheimer Nursery School, an active laboratory with observation booths and recording equipment. UC Riverside is one of California's least-expensive public universities. Students in the Department of Psychology can snag the Arambel Memorial Award to make it even cheaper, whether they're pursuing a BA/BS in Psychology or a BA/BS in Neuroscience/Psychobiology. Upperclassmen majoring in the latter can apply for the $500 Riesen Senior Psychobiology Award. No promises, but PhD candidates in the department usually receive five years of funding via fellowships, scholarships, teaching and research assistantships, and out-of-state tuition grants. In addition, the department's travel award covers costs to present at one conference per year, and teaching assistants and student researchers receive health insurance. UC San Diego's Division of Social Sciences offers Bachelor of Arts and Bachelor of Science degrees in psychology. Students admitted to the BS in Psychology program can choose from the following areas of specialization: clinical psychology, cognitive psychology, human health, sensation and perception, developmental psychology, and social psychology. Graduate students are accepted only to the Doctor of Philosophy program. A Master of Arts in Psychology can be earned en route to a PhD, but it is not offered as a terminal degree. A PhD in Psychology and Cognitive Science degree is available, as well as a PhD program with a specialization in anthropogeny. Upper division psychology majors can apply for the Gregory T. Bryan Scholarship ($2,000 per year for two years). Through its Department of Psychology, the University of Minnesota offers Bachelor of Arts, Bachelor of Science, Master of Arts and Doctor of Philosophy degrees in psychology. The Bachelor of Arts is a liberal arts-focused program that includes a minimum of 36 credits of major coursework. The Bachelor of Science emphasizes scientific studies in the field of psychology and beyond through a minimum of 54 major credits. Both B.A. and B.S. students have the opportunity to participate in the departmental honors program, which requires an honors thesis. Graduate psychology programs are available in eight areas of specialization: biological psychopathology; clinical science and psychopathology research; cognitive and brain sciences; counseling psychology; industrial/organizational psychology; personality, individual differences and behavior genetics, quantitative/psychometric methods, and social psychology. Additionally, the College of Education and Human Development offers a graduate program in school psychology. Rutgers University's Psychology Department offers an undergraduate major and minor in psychology, as well as a psychology doctorate program. The psychology major requires 38 major credits, including coursework in general psychology, quantitative methods, a lab course and four core courses in the sub-disciplines of behavioral and systems neuroscience, clinical psychology, cognitive psychology and social psychology. The Ph.D. in Psychology is available in five concentrations: behavioral and systems neuroscience, clinical psychology, cognitive psychology, social psychology and interdisciplinary health psychology. Students in the Ph.D. program are guaranteed five years of financial support if they enter without a master's degree and three years of financial support if they enter with a master's degree. Financial support is provided through graduate fellowships, teaching assistantships and graduate assistantships. Students seeking a degree in psychology at Buffalo State have two options. The Bachelor of Arts degree gives students a broad background in the subject, including classes in statistics, experimental methods, cognitive psychology, lifespan development, and abnormal behavior. The Bachelor of Science in Psychology is designed for students who have a specific career goal in mind. The program has more required courses than the B.A. program, and students must apply to and be accepted to the B.S. program. Once in the program, they choose an area of specialization: aging, biological psychology, clinical psychology, environmental psychology, industrial/organizational psychology, or infancy. Psychology majors can take part in research through faculty-supervised research teams, independent study, or the Psychology Club's research team. The Psychology Department at SUNY Oswego offers a variety of interdisciplinary programs as well as a major in psychology. Students can earn a Bachelor of Arts in Psychology or pursue an interdisciplinary program in psychology and philosophy. The department is also involved in some of the five-year programs offered at SUNY Oswego, in which a student earns a bachelor and master's degree in five years. One such program, for students interested in leadership or management, allows a student to earn a B.A. in Psychology and a Master of Business Administration. For students with a technical bent, the college offers a five-year program leading to a B.A. in Psychology and a Master of Arts in Human-Computer Interaction. UC Berkeley's graduate psychology program is the best in the nation, according to U.S. News, which put the program at the top of its 2018 list of Best Grad Schools. Undergraduate majors get broad exposure to the field and are encouraged to dig deep into at least one major content area. An honors program is offered for students who want to prepare a senior research thesis. The department also grants a Ph.D. in Psychology, a full-time program that is not open to students seeking a terminal master's. The program has a heavy research emphasis with candidates specializing in any of the department's six research areas, including behavioral neuroscience, cognition, and social-personality. Grad students receive five years of funding. Psychology majors at the University of California Davis can choose a Bachelor of Science with a quantitative or biology emphasis, or they can pursue a Bachelor of Arts. For a ground level-view of psychology research, students can volunteer as a research subject, and later they might assist in a faculty member's lab. Internships are another way they can get experience and earn credit. The department also grants a Ph.D., with students performing research in one of the department's five areas of specialization. All graduate students receive funding through a combination of fellowships and teaching and research positions. The 2018 U.S. News ranking of Best Grad Schools places the UC Davis psychology program at No. 26. Westfield State's popular undergraduate Psychology major and minor has all the hallmarks of a good program: an active chapter in Psi Chi, the international honor society for the discipline, which meets monthly and performs service projects and workshops; a Psychology Club; and, of course, a hands-on capstone experience. But departmental offerings explode at the master's level, where psychology is the school's second-largest graduate program. It boasts five separate master of arts programs, covering areas such as behavior analysis (also available as a postgraduate certificate) and mental health. The department also builds off Westfield's Education Department to provide initial licensure to those who enroll in the School Guidance Counseling MA. To earn a bachelor's degree in psychology, Barnard students must complete 10 courses in psychology, including seven lecture/seminar classes, two lab classes and a senior requirement, along with a course from a cognate discipline and two related science lab classes. To fulfill the senior requirement, a student must complete individual projects, a senior research seminar or a psychology seminar. Barnard students have many opportunities to acquire supervised research and field experience, including at the college's Toddler Center or in fieldwork classes. Faculty members also use student research assistants. Faculty members are researching subjects such as social and cognitive development, memory, language, animal learning, social stereotyping, conflict resolution, and behavioral neuroscience. Barnard College also houses a psychology museum. Psychology majors at SUNY Oneonta can pursue a Bachelor of Arts or Bachelor of Science curriculum or a double major, but no minor is offered. The Psychology Department has strong ties with local social service and health organizations that host student interns over the summer. Students can earn up to 16 credits through internships. Students are also encouraged to conduct research, and many psychology faculty members use student research assistants. Psychology majors can share their interests with fellow students in the Psychology Club or as a member of the campus chapter of Psi Chi, the psychology honor society. Appalachian State offers degrees in psychology at the graduate and undergraduate levels. Undergrads who earn the general Bachelor of Arts in Psychology complete 41 or 42 credits in the major and are required to have a minor. The Bachelor of Science in Psychology program allows students to concentrate in business, health studies, human services, natural science, or social science. To earn the B.S., students complete 41 to 46 credits in the major and 21 credits in the concentration area. Graduate psychology programs include a Master of Arts in Industrial-Organizational Psychology and Human Resource Management and Master of Arts in Psychology. The university also offers to a combined Master of Arts and Specialist in School Psychology degree. The Department of Psychology at University of Massachusetts-Amherst offers a Bachelor of Arts and a Bachelor of Science in Psychology, as well as graduate programs in behavioral neuroscience, clinical psychology, developmental science and social psychology. The B.A. is the most common program for undergraduate psychology students. The B.S. is designed for students with strong science and math backgrounds and offers an optional concentration in neuroscience. The PH.D. in Clinical Psychology prepares students for clinical research and offers an optional concentration in child, adolescent and family (CAF). The PH.D. in Social Psychology, which offers an optional concentration in the psychology of peace and violence, prepares students to conduct research and teach at the university level. The Department of Psychology at St. Cloud State University offers a Bachelor of Arts in Psychology, an undergraduate psychology minor and a Master of Science in Industrial/Organizational Psychology. The B.A. in Psychology requires 41 major credits, including a 14-credit core covering subjects such as introductory psychology, psychological statistics and psychological data analysis. Students must also complete a three-credit capstone experience in the form of an advanced topic course, research course, literature review course or field experience. The M.S. in Industrial and Organizational Psychology is a 41-credit program that can be taken in a thesis track or a portfolio track. M.S. students are eligible for graduate assistantships, with two to three graduate assistantships awarded in the fall and spring semesters. Michigan Technological University's Department of Cognitive and Learning Sciences offers a Bachelor of Science in Psychology, an undergraduate psychology major and Master of Science and Doctor of Philosophy degrees in applied cognitive science and human factors. The B.S. in Psychology requires 12 major core courses and seven major elective courses. Students in the program learn about various subfields of psychology, including cognitive psychology, forensic psychology, human factors psychology, educational psychology and sports psychology. The M.S. in Applied Cognitive Science and Human Factors requires a minimum of 32 credits of coursework, including a master's level thesis or report. Psychology majors also have the opportunity to participate in student organizations like the Association of Psychology Students and the Human Factors and Ergonomics Society (HFES). The Sociology, Psychology and Criminal Justice Department at Wayne State College offers Bachelor of Science and Bachelor of Arts degrees in psychology and psychology education. The psychology major includes 36 credits of major coursework, including courses in general psychology, personality psychology, experimental psychology, social science statistics and the history of psychology. Students are also required to complete 12 to 18 credits of psychology electives. Students who want to teach psychology can earn a bachelor's degree in conjunction with a psychology endorsement to teach grades 7-12. Students who choose to complete a psychology endorsement must also complete a second endorsement in another subject area. Additionally, psychology students have the opportunity to complete internships and participate in student organizations like the Psychology and Sociology Club. Students who want to use psychology in a business setting can earn a Bachelor of Applied Psychology at Farmingdale State, where the program includes a concentration in Industrial/Organizational Psychology. The degree qualifies students for entry-level jobs in human resource management or for graduate education. To receive the degree, students must earn at least 121 credits, including 16 credits in core psychology classes and 15 credits in the concentration area. The program requires all students to complete a two-semester internship in human resources or an applied research project. The Psychology Club sponsors professional guest speakers and organizes field trips, and outstanding psychology students can join the Farmingdale State chapter of the Psi Chi national psychology honor society. CSU Long Beach offers a Bachelor of Arts in Psychology program designed to provide students with a basic yet broad understanding of the principles of psychology. The curriculum includes courses such as introductory statistics, research methods in mental health, psychobiology, psychology of emotion, human cognition, and evolutionary psychology. The university offers a Master of Arts in Psychology degree with an option in psychological research. There is also a Master of Science in Psychology program with two options - human factors and industrial and organizational psychology. Incoming junior or senior psychology students can apply for the Jana Carpenter Memorial Endowed Scholarship, which awards three $1,500 to $2,500 scholarships each year. Qualified MA students are considered for the J. Robert Newman Scholarship. Iowa State University offers an undergraduate major in psychology, as well as doctoral programs in cognitive psychology, counseling psychology and social psychology. Undergraduate psychology majors at ISU can choose to complete either a Bachelor of Science or Bachelor of Arts degree. The B.S. degree is the traditional degree choice for psychology majors and requires more coursework in math and the natural sciences. The B.S. does not require the completion of a minor or additional major, but the B.A. does. Students can be admitted into ISU's three psychology doctoral programs with a bachelor's degree or master's degree. Those admitted with a bachelor's degree will complete a thesis-based master's degree at ISU while completing the doctoral program. A graduate certificate in quantitative psychology is also available. The College of Liberal Arts and Sciences at UCF offers a Bachelor of Science in Psychology degree with the following areas of specialization: behavior analysis, counseling psychology, developmental psychology, behavioral and cognitive neuroscience, and social psychology. On the graduate level, students have the option of pursuing either a Master of Arts or a Master of Science degree in psychology. There is also a Doctor of Education degree in school psychology available. The Doctor of Philosophy in Psychology program offers specializations in clinical and health psychology and in general psychology. Doctoral students can pursue a concurrent degree in law to earn a PhD/JD degree. Psychology majors can apply for the Thomas G. Pye Scholarship ($2,000) and the David Robert Ferguson Memorial Award ($1,000). Berea College offers a Bachelor of Arts in Psychology designed for students interested in pursuing graduate studies to become professional psychologists, as well as those who want to apply their psychology training to business and social service positions immediately after graduation. The B.A. curriculum includes four core courses, three additional psychology courses, two laboratory courses, a science course and a senior research project as a capstone. Psychology students also have the opportunity to participate in summer research, work as a departmental teaching assistant or office assistant and present research at conferences. Additionally, psychology students with outstanding academic records can participate in Psi Chi, the National Honor Society in Psychology. Alfred University offers a psychology program that includes an undergraduate major and minor in psychology. Additionally, the graduate school offers a master's/certificate of advanced study program in school psychology and a Doctor of Psychology in School Psychology. The undergraduate major in psychology offers four tracks of study: a general psychology track, a clinical/counseling psychology track, an experimental psychology track and a child psychology track. Each track requires between 38 and 42 credits of major coursework. The psychology minor requires the completion of 24 credits. Psychology students also have the opportunity to participate in student organizations like the national psychology honor society Psi Chi and the Psychology Club. Full-time psychology graduate students are awarded graduate assistantships that cover half the cost of tuition. Binghamton University offers bachelor's and Ph.D. degree programs in psychology. Undergrads can earn a Bachelor of Arts in Psychology and, if interested, follow a track in Applied Behavior Analysis. Psychology majors must earn 58 major credits by taking 14 or 15 classes plus a laboratory class. The Applied Behavior Analysis program is open to students who have completed a prerequisite class, and all program applicants must undergo an interview. Doctoral students can choose a specialization in Behavioral Neuroscience, Clinical Science, or Cognitive and Brain Sciences. All graduate students in the program qualify for tuition waivers and receive stipends for support. Binghamton has placed all its recent recipients of the Psychology Ph.D. in jobs in academia, research, or industry. Michigan State University's Department of Psychology offers Bachelor of Arts and Bachelor of Science degrees in psychology, as well as master's and doctoral programs in psychology. The B.A. in Psychology is designed for students who are stronger in writing and the humanities, while the B.S. in Psychology is designed for students who are stronger in science and math. Both degrees can prepare students for graduate studies, although students pursing a graduate program that is very science-focused may want to attain the B.S. degree. The Psychology Department's M.A. in Program Evaluation is a 37-credit, online program that can be completed in 16 months. The Department also offers on-campus PH.D. programs in behavioral neuroscience, clinical psychology, cognition and cognitive neuroscience, ecological-community psychology, organizational psychology and social/personality psychology. The Psychology Department at Queens College grants a bachelor's degree in psychology that requires students to take at least 36 psychology credits. Majors should also take classes in math, biology, sociology or anthropology, and philosophy. A 55-credit interdisciplinary Bachelor of Arts in Neuroscience is offered for students who want to do research in that field. Three programs leading to a Master of Arts in Psychology are available. The M.A. in Behavioral Neuroscience is for students who plan to enter a doctoral program or do research in the field of neuroscience. The Applied Behavior Analysis program is for students who want to become Board Certified Behavior Analysts. The General Psychology master's program prepares students for graduate study or research careers. Brigham Young University offers a Bachelor of Science in Psychology degree through the College of Education and Human Development. Students can choose from three emphasis areas: general psychology, industrial organizational psychology, and health psychology. Psychology majors are required to complete the following courses before taking advanced classes in their chosen emphasis area: social psychology, developmental psychology life span, cognition, and experiencing research. There are pre-approved clusters of psychology courses that are available for non-major students who wish to study psychology in greater depth, but without pursuing it as their major. Pre-approved clusters are offered for different majors, including business, sociology, health sciences, and recreation management. Internship opportunities are available at the Madison Middle School and the Arivaca Ranch Innovative Equine Therapy. City College of New York offers psychology degrees at all levels from bachelors to doctorate. Undergrads may earn a Bachelor of Arts or Bachelor of Science in Psychology and are required to complete at least 32 credits in psychology classes. The general master's program allows students to choose between a research-based thesis option or a coursework-based non-thesis option. The college also offers an accelerated B.A./M.A. program in psychology for outstanding students. The Ph.D. program at CCNY is in Clinical Psychology. Research facilities at the college include a trauma and addiction lab, an EEG lab, and an infant lab. The college's chapter of the Psi Chi National Honor Society in Psychology supports undergraduate and graduate student research. Hunter College's Master of Arts in General Psychology allows students to focus on Applied and Evaluative Psychology; Social, Cognitive, and Developmental Psychology; or Biopsychology and Comparative Psychology. The Master of Arts in Animal Behavior and Conservation is a 36-credit specialized program for those interested in studying animal behavior. Hunter's undergraduate psychology program focuses on research and requires all students to take a statistical methods class. Undergrads can enroll in the honors program, which requires them to work closely with a faculty member on research and prepare a thesis. Graduate and undergraduate students are encouraged to become involved in faculty research. Faculty are investigating topics such as sensory systems in animals, the neurobiology of moods, and coping with stress. The Department of Psychology & Philosophy at Texas Women's University offers a Bachelor of Science in Psychology, a Master's Program in Counseling Psychology, and a Doctoral Program in Counseling Psychology. The bachelor's degree has four different tracks: general track, graduate school preparation, pre-occupational therapy, and pre-physical therapy. Students may join the Psi Chi Honor Society. Students also may qualify for scholarships such as the Dr. Karen A. Jackson Psychology Scholarship, the Dr. Brian W. Campbell Memorial Scholarship, the Dr. Daniel C. Miller Graduate Scholarship, and General Psychology Scholarships. SUNY Polytechnic Institute grants a Bachelor of Arts in Psychology. To earn the degree, students must earn 40 credits in major requirements, including core courses in the history and systems of psychology, research methods, evaluation research, and a senior seminar. They also take a foundational course and several intermediate and advanced courses they select from the department's 200-, 300- and 400-level classes. The department also offers an interdisciplinary minor in gerontology, aimed at students preparing for careers in medicine, social service, or psychology. SUNY Poly has a Psychology Club that sponsors speakers and career events, and a chapter of Psi Chi, the national honor society in psychology. Each year Psi Chi invites a distinguished psychologist to present a lecture. Brooklyn College's Psychology Department has a long and distinguished history, and its faculty once included famed psychologist Abraham Maslow. More than 1,000 undergrads are majoring in psychology, and the department also has 200 master's students and 30 students in its doctoral program. Undergrads can earn either a Bachelor of Arts or Bachelor of Science in Psychology. The department offers Master of Art degrees in Experimental Psychology, Industrial Organization: Human Relations, Industrial Organization: Organizational Behavior, and Mental Health Counseling. Ph.D. candidates can choose from many training areas, including behavioral and cognitive neuroscience, human development, cognition language and development, and applied social psychology. The department offers merit and need-based scholarships to undergraduate and graduate students, such as the merit-based Lee's Laboratory Fund. SUNY Plattsburgh offers a Bachelor of Arts in Psychology that requires students to earn 40 credits within the major. All psychology majors take classes in general psychology, experimental design, psychological statistics, human development, cognitive psychology, biopsychology, personality, and social psychology. Students also have three psychology electives in the program to acquire an in-depth understanding of an area within the discipline. To gain practical experience, students can perform fieldwork or internships, or work with faculty on research. Plattsburgh also offers a Master of Arts and Certificate of Advanced Study in School Psychology, which can lead to state and national certification as a school psychologist. Psychology majors are eligible for awards and scholarships such as the Redcay Outstanding Student Scholarship ($250). The Department of Psychology at the University of North Texas offers a Bachelor of Arts in Psychology, a Bachelor of Science in Psychology, and Ph.D.'s in Clinical Psychology, Counseling Psychology, and Applied Experimental Psychology. The goal of the psychology department is to provide students with a basis of psychological knowledge and also to expose students to the large number of ways that knowledge can be applied in everyday life. Students who excel may join the student chapter of Psi Chi, the psychology honor society. Students may also qualify for scholarships such as the Louis C. Weber Scholarship for Outstanding Undergraduate Student and the Louis C. Weber Scholarship for Psi Chi Award. Interested in studying psychology on a budget? You have every reason to be intimidated. There are many kinds of degrees, accreditation is confusing and licensure requirements are almost impossible to understand. What kinds of degrees do therapists and social workers need? Should I apply for a PsyD or a PhD to become a clinical psychologist? What does APA-accredited mean? Here’s where our guide can help. In the first part, we explain what each psychology degree looks like, why people earn them and how they can prepare you for licensure. In the second, we discuss why regional, APA and non-doctoral accreditations matter so much. In the third, we clear up the confusion surrounding clinical licensing. An associate’s degree is a 2-year degree that introduces you to the fundamental principles of psychology. Like many students, you might choose to take this degree at a community or junior college and apply your credits to a bachelor’s degree further down the track. Associate of Science (AS) in Psychology: Courses may include science, mathematics and statistics. Associate of Arts (AA) in Psychology: Courses may include liberal arts topics (e.g. foreign language, English, etc.). However, there really aren’t that many opportunities in the field of psychology with an AA or AS. If you want to improve your options, you’ll need to invest in further education. Note: Thinking of doing an online associate degree? Make sure your credits will be transferable to a bachelor’s degree. A bachelor’s degree in psychology is a 4-year degree that grounds you in the field. You’ll take a wide range of courses in the first two years, then focus on electives in psychology in your junior and senior years. Bachelor of Science (BS) in Psychology: Courses may include science, mathematics and statistics as well as research methods and/or applied psychology. Strong prep for a career in science, entry to medical school or graduate work in psychology. Bachelor of Arts (BA) in Psychology: Courses may include social sciences and humanities (e.g. foreign language). Often used as a stepping stone to careers outside of psychology or as a base for graduate study in management, law, counseling, etc. In fact, APA’s Center for Workforce Studies (CWS) estimates that only 20-24% of people with a BA or BS in psychology continue to graduate study in psychology (8-10% go on to doctoral degrees). Instead, BA/BS graduates apply their understanding of how people think to jobs in law, journalism, marketing, teaching, childcare, etc. However, if you wish to qualify for professional licensure as a therapist, social worker or counselor or work as a licensed clinical psychologist, you will need a master’s or doctoral degree. Note: The APA provides a complete list of possible jobs for psychology graduates in Appendix E of the APA Guidelines for the Undergraduate Psychology Major. A master’s degree in psychology is a 2-3 year graduate program that usually involves a dissertation or capstone project. Students use this program to qualify for certain licensures, earn credits for a PhD or PsyD or to advance their careers. Since licensure requirements are frequently changing, please check with your state’s licensing board for exact details on the degree required (e.g. master’s or doctorate). We talk more about master’s degrees & licensure in our section below. Master of Arts (MA) or Master of Science (MS) in Psychology: As a general rule, all master’s in psychology programs require students to have a bachelor’s degree in psychology. Occasional exceptions are made for applicants with extremely high GRE scores (top 1%). This degree is sometimes used to burnish professional qualifications or as a stepping stone to a doctoral degree. However, many PhD programs (i.e. Clinical Psychology, Developmental Psychology, Social Psychology, Experimental Psychology, etc.) have their own 5-6 year programs with a master’s degree built in. To become a licensed clinical or counseling psychologist, you will need a PhD or PsyD. Master of Arts (MA), Master of Science (MS) or Master of Education (MEd) in Counseling: This degree is typically designed to meet state licensure requirements for the Licensed Professional Clinical Counselor (LPCC) qualification and/or CACREP-accreditation standards. It does not require a specific bachelor’s degree for admission, but it may require undergraduate coursework in psychology or a related field. All of these programs will allow you to specialize in a certain field (e.g. marriage and family counseling). On rare occasions, you may run into a Master of Arts in Counseling (MAC). Master in Social Work (MSW): This is a common degree for anyone wishing to become a Licensed Clinical Social Worker (LCSW). MSW programs often offer a clinical/direct practice track (working directly with clients) or a macro practice track (e.g. community organization, human services management, etc.). Master of Arts (MA), Master of Science (MS) or Educational Specialist (EdS) in School Psychology: This is the baseline degree for professional licensure as a school psychologist. EdS and professional master’s degrees are commonly referred to as specialist level programs (60+ graduate credits) — please see our section on Specialist Degrees. Master of Arts (MA) or Master of Science (MS) in Marriage & Family Therapy (MFT): This degree is used to prepare a graduate to become a Licensed Marriage & Family Therapist (LMFT/MFT). Master of Arts (MA) in Art Therapy: According to the American Art Therapy Association (AATA), a master’s degree is required for entry-level practice in art therapy. Because work opportunities are often limited for those without licensure, some states (e.g. New York, New Mexico, Kentucky, Maryland and Mississippi) have developed state license programs (e.g. Licensed Creative Arts Therapist (LCAT) or Licensed Professional Art Therapist (LPAT)). In addition, a few master’s programs have combined counseling and art therapy so that the degree will meet the requirements for the LPCC. Professional Licensure: Thinking about becoming a Licensed Professional Clinical Counselor (LPCC), Licensed Independent/Clinical Social Worker (LISW/LCSW) or a Licensed Marriage & Family Therapist (LMFT)? Before committing to a program, we recommend you check with your state’s licensing board for specific licensure education requirements. Although a master’s degree has been the standard, some states may now require a doctoral degree. In addition, many licensure programs also include practicums, supervised clinical experience and exams. To learn more, see our section on Professional Licenses for Therapists, Social Workers & Counselors. Clinical Psychologist Licensure: Interested in becoming a licensed clinical or counseling psychologist? You will need a PhD or PsyD. In fact, many students choose to skip the master’s and go straight into a doctoral degree program. All of these make a good impression on doctoral applications. If you’re unsure about whether a master’s or doctoral program is right for you, check out the APA’s FAQs About Graduate School. A specialist degree in psychology occupies the middle ground between a master’s and doctoral degree. It is usually targeted towards professionals who are interested in becoming school psychologists. Psychology Specialist (PsyS): Intended for those practicing in school settings. Students complete 4 years of graduate study: 2 years of earning an MS and 2 years of earning a specialist degree. The first 3 years often focus on coursework (including clinical practice) and the last year consists of an internship. Graduates can also use this as the first part of PsyD or transfer their credits to an EdD. Educational Specialist (EdS): Intended for those with a master’s degree and work experience in education. Students complete 30 credit hours beyond a master’s degree. The EdS does not emphasize original research like the PhD or EdD but it may act as a bridge to those degrees. Some graduates use it for school psychologist licensing requirements or advanced licensure (e.g. principalship). Specialist in School Psychology (SSP): Similar to EdS, except that the program is located in the Department of Psychology, not Education. Undergraduate Certificate: Used by students to supplement a non-psychology bachelor’s degree, study a specific field of psychology or prepare for a psychology-related job. Post-Baccalaureate Certificate: Used by bachelor’s holders to prepare for graduate studies (common for those without a bachelor’s in psychology), gain a competitive edge when applying to teaching/research positions or change one’s career to psychology. Post-Masters Certificate: Used by master’s holders to earn credits for state licensure (very common), prepare for a doctorate, advance a career or concentrate on a specific field. Post-Doctoral Certificate: Used by licensed professionals to qualify for additional state licensure, receive advanced training in their current specialty or expand their skills to a complementary specialization. Check with the university and your State Licensing Board if you wish to use your certificate for state licensure. The Board may require your program to have certain accreditations (e.g. regional) and clinical components. A doctoral degree in psychology takes 5-7 years and is the highest qualification available. Some schools require you to hold a master’s degree; many allow you to go straight into a combined master’s/doctoral program if you already hold a bachelor’s degree. In order to become a licensed clinical psychologist, you must have a PhD or PsyD from an APA-approved program. These generally require 4 years of research and clinical training and 1 year of internship. Around 1/2 of licensed clinical psychologists opt for a PhD and 1/2 for a PsyD. Doctor of Philosophy (PhD) in Psychology: Commonly earned for clinical licensure. Housed in the Department of Psychology, PhDs require students to complete original research/dissertation plus theoretical/applied training. If the PhD is granted by a university (and not a free-standing professional school), graduates can apply for tenure-track faculty positions at 4-year universities. Doctor of Psychology (PsyD): Commonly earned for clinical licensure. With a strong focus on clinical training, the PsyD is known as the “practical” degree and the PhD as the “research” degree. For example, there is no dissertation with a PsyD. PsyDs are usually offered by free-standing professional schools or a university’s School of Education. Non-Clinical PhDs: Non-clinical PhDs cover topics such as cognitive psychology, developmental psychology, institutional/organizational psychology, etc. Instead of becoming licensed psychologists, non-clinical PhD graduates work as teachers and researchers in academic settings. Doctor of Medicine (MD): Earned by psychiatrists. Students must complete medical school and 3 years of training in mental health specialties. Doctor of Education (EdD): Often earned by leaders in PreK-12 education and therapy. The EdD tends to focus heavily on counseling psychology and can include work on child development and education, teaching/schooling practices and the development of educational leaders. Note: Opt for a doctoral degree if you are interested in teaching or doing research at a university level. Debating between a doctoral program in “counseling” or “clinical” psychology? There is no longer much difference between the two. Graduates typically receive the same professional benefits (e.g. licensure eligibility, insurance reimbursement, academic opportunities etc.). There are over 6X more graduates of doctoral clinical psychology programs than counseling programs. Broadly speaking, clinical programs are housed in the Department or School of Psychology; counseling programs in the College of Education. Clinical programs may focus more on projective/intelligent assessment and behavioral/psychodynamic therapy; counseling programs on career/vocational assessment and client-centered/Rogerian approaches. Clinical psychologists lean towards private practice; counseling psychologists towards college counseling centers. Whichever degree you choose (undergraduate or graduate, online or on-campus), we strongly recommend you attend a school with regional accreditation. This is a mark of quality granted to a school or university by one of six regional accrediting bodies (e.g. New England Association of Schools and Colleges). We talk more about the important difference between regional and national accreditation in our article: Accreditation: Understanding the Difference Between Real Schools and Diploma Mills. To be eligible for licensure, most State Licensing Boards require, at a minimum, applicants to complete a program from a regionally accredited institution. To become an APA member, you must receive your education and training from a regionally accredited institution. Note: You can find a complete list of regional & program accreditations in The Database of Accredited Postsecondary Institutions and Programs from the U.S. Department of Education’s Office of Postsecondary Education (OPE). The American Psychology Association (APA) Commission on Accreditation (CoA) is a subject-specific accrediting body whose goal is to make sure doctoral programs in psychology are strong enough to prepare students to become licensed clinical psychologists. APA does not accredit non-doctoral programs (e.g. master’s and bachelor’s degrees) or areas of psychology that won’t lead to clinical practice (e.g. social psychology). It does not accredit schools or individuals. Many State Licensing Boards require that you attend an APA-accredited program in order to gain a license as a clinical psychologist. Some agencies of federal government only hire graduates of APA-accredited programs. You can find more answers to FAQs about APA Accreditation on the APA’s website. You’ll see a lot of these acronyms mentioned on university websites. But, as always, we recommend you check with your State Licensing Board to determine what accreditations your program should have. Note: Even if you’re only interested in an undergraduate or master’s program, it’s still worth finding out if the school’s doctoral programs are APA-accredited. This is a mark of quality which employers respect. To practice as a clinical or counseling psychologist (e.g. assess, diagnose, treat and prevent mental disorders), you must hold a doctoral degree in psychology. To practice as a therapist, social worker or counselor, or a school psychologist, you will need a master’s, specialist or doctoral degree. In certain states, industrial psychologists do not need to be licensed. Groups that do not deal directly with patients may also be exempt (e.g. research psychologists working in a university, corporation or lab). Note: For more help in understanding the process of licensure, check out the information on APA Early Career. Clinical psychologists provide psychotherapy, conduct psychological testing and diagnose mental illnesses. Psychologists acquire a license to practice from their State Licensing Board. Some states will also require you to pass an oral exam (e.g. competency or laws/ethics) and/or an exam on jurisprudence (mental health law). To renew your license, you will have to gain continuing education credits (e.g. audited classes, approved workshops, etc.). Note: In seeking to fulfill your clinical internship requirement, try as hard as you can to complete an APA-accredited internship. Those without one may be barred from some jobs, find it impossible to get licensed in certain states or miss out on post-doctoral fellowship opportunities. School psychologist licensing requirements are different from clinical psychologist requirements. School psychologists gain their certificate or license to work in public schools through the state’s Department of Education, not the State Licensing Board. In addition to state licensing, the NASP offers a national credential called the Nationally Certified School Psychologist (NCSP). Even if you are certified as a school psychologist by your state, you must apply separately to become an NCSP. Note: Check out the NASP’s State School Psychology Credential Requirements for a list of separate state requirements. There may also be specific exams related to your field of study (e.g. the National Clinical Mental Health Counseling Exam). Please check with your state licensing board to find out what degree and training is required. Note: Some states may require a doctoral degree instead of a master’s degree. Be sure to check! What is the Difference Between Licensure & Certification? A variety of non-profit and for-profit organizations offer certifications to licensed professionals. The American Board of Professional Psychology (ABPP) is one of the most well-known providers of board certification in psychology.